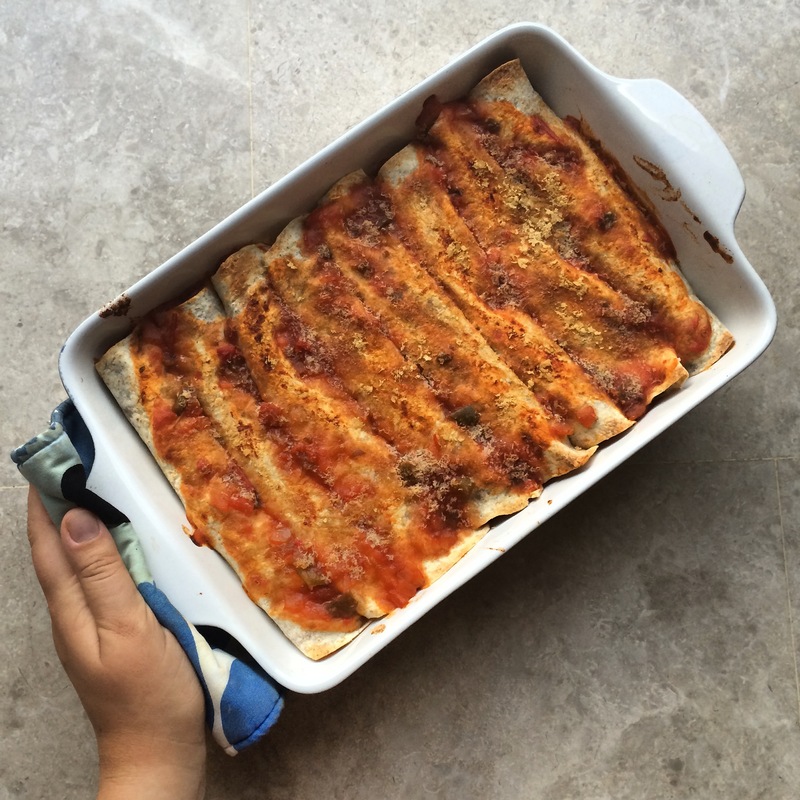 Today I’m sharing with you my favourite family meal to cook; enchiladas. These are actually really easy to make but look quite impressive when you serve them. They get devoured in my house every time; by vegans and non-vegans alike. Another plus is that a lot of the ingredients are staple pantry or freezers items and so you can often make these as a last minute meal. 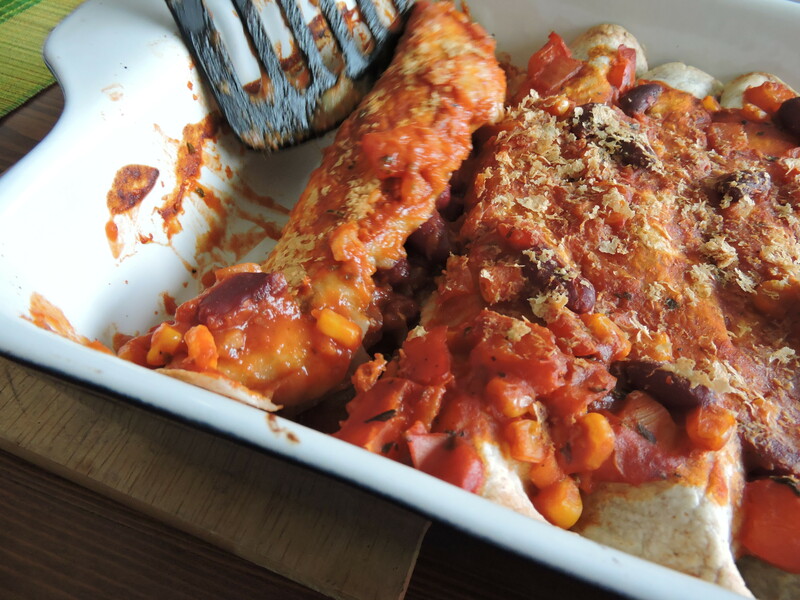 Hearty, filling and delicious; try making these for you next family meal! Prep your vegetables: cut up your onion, garlic, red pepper and cherry tomatoes. Heat up your olive oil in a pan and add in your onion and garlic. Stir until slightly browned and add in your cherry tomatoes. Add half of your cup of water to the pan and cover. Let sit for 10 minutes, stirring occasionally. Once your cherry tomatoes have softened and the water has evaporated, add in the red pepper and corn. Add the remaining half of water and cover. Let sit for 10 minutes (until vegetables soften slightly). After 10 minutes, add in your black beans, tomato purée and spices. Mix together well and let simmer on a low heat. In a different pan, heat up your refried beans. Take both your pans off the heat, grab your tortilla wraps and baking dish, ready for assembly. 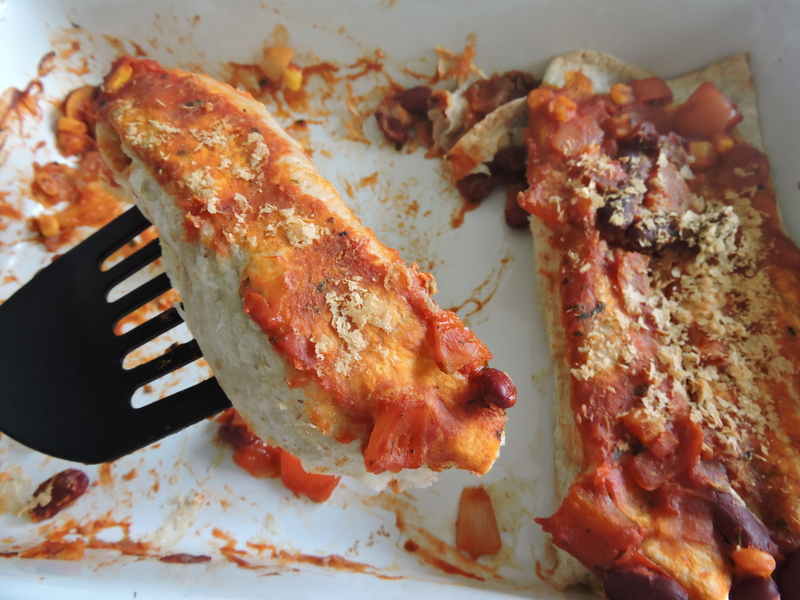 Spread a layer of refried beans onto each tortilla, as well as two scoops of your sauce. Roll up and place in your baking dish. Repeat this for all 8 tortilla wraps. If you have some sauce leftover, spread this on top of your wraps. If not, you can add salsa on top. Also add nutritional yeast on top if desired. Bake in the oven for 25 to 30 minutes, until edges start to turn slightly brown. Let me know if you try out this recipe; I would love to know!